Again this is first kind of Opencart image news slideshow, Where you can display your slideshow images + news content. Add any number of images with text. Adjust height, width from admin. Installation of the Opencart module is super simple after downloading the Opencart module. you will get a zip file of this module, now unzip the module zip you will find the admin folder inside that move that admin and catalog folder in opencart root as per the screenshot. After moving both the folder go to extension > module and install it. The admin will set the layout by following the path- Design > Layout and then click on edit for which the admin wants to set the layout. After installed module edit it and this page will open .Complete all the fields according to guidelines.Here enter your image path of image folder where your image are and use ‘ / ‘ in the last.Enter you image-related fields like Description, Description width, height etc.After complete all the fields add module where your want and save it. In this Module various option you can see like different themes and slide styles. 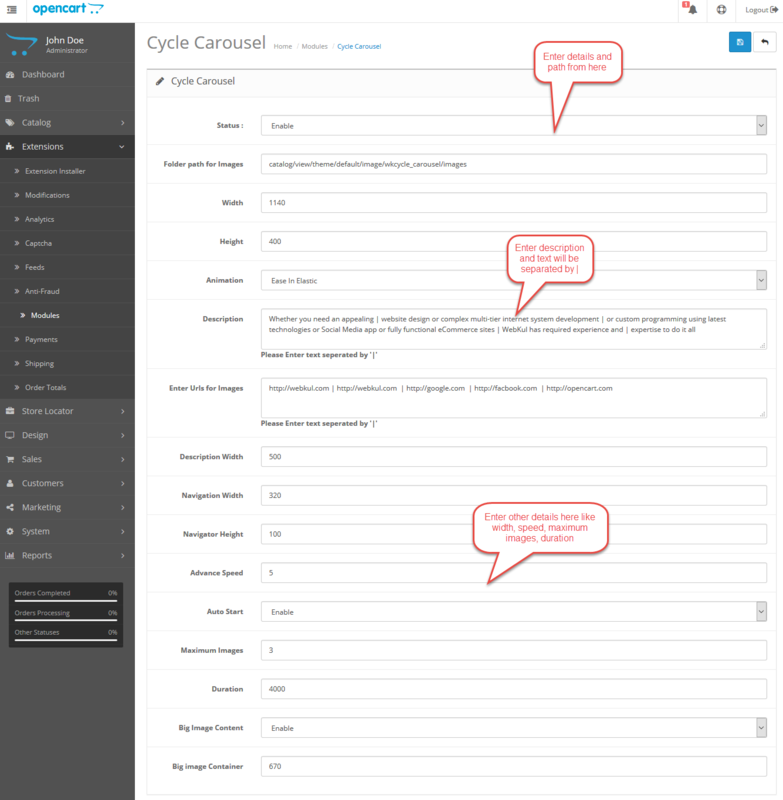 After entering all the information, you will get a beautiful Cycle Carousel. All of that informations are very much self-explanatory still have any doubt please add a support ticket at https://webkul.uvdesk.com/.